They say Facebook stimulates narcissism, amplifies anxieties and triggers dependence. These are three of the conclusions various studies put forward, but we’d really like to understand more. What else is Facebook doing to us? What happened with our lives since we started spending hours, every day, on Facebook? How is our interaction with the world changed, how do we influence the world and how are we now influenced by it? And how does the interconnection between Facebook and reality really look like? 1. On Facebook, everyone is the center of the world. Breaking out from your inner space, the self-revelation process and the steps into a planetary arena are setting alight all your private stages, be they bright or dim, rearranging the world into a uniform theatre where the stage merges with the loges and the stall and the backstage. We are all, simultaneously, both actors, more and more hungry for applause, and spectators, more and more bored, more picky and more critical. 2. Thanks to Facebook, our lives pack themselves up. It’s not only that by constantly posting stuff, we constantly whistle up moments and sensations we see as relevant (usually they’re not), but by discovering and rediscovering people, we resuscitate pasts we would otherwise let drift away – and thus we hand over vital breathing spaces. When reflecting at our lives, almost everything we lived through looks somewhat blurred. Facebook is now opening doors to those blurred areas and we see, as in fairy tales, that behind those doors we’re greeted by old mirrors that would sometimes better stay covered. 3. Thanks to Facebook you are likely to rediscover yourself in a stranger. Have you ever been surprised to discover you resonate more often with the ideas or feelings of perfect strangers instead of those of close friends? That’s a great opportunity, but it’s also a threat to individual stability. The Facebook friendship is the illusion we’re walking on – and it’s like a walking on a wire, trustful that underneath there’s a safety net. Well, underneath there’s simply the reality. 4. À propos: Facebook is a network of suction cups thrown over the reality, a system of sensors sending information to all contact points. For each user, but mainly for its owners, Facebook adds up to senses and rationale – it’s a new tool to access, assimilate and control the world. Facebook is a biography overlapped on the one you lived, a stylized mask, a croquis in bold lines, like some fourth dimension that, instead of potentiating the first three ones, it’s concealing them. 5. 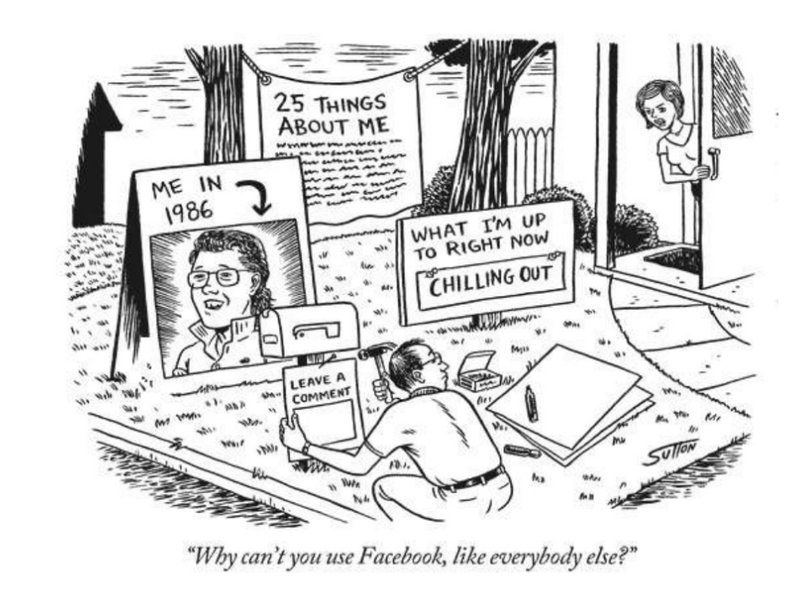 By logging into Facebook you choose to be observed. Besides tapping into people’s attention and acquiring some sort of an audience, to be observed means to become prey. Relatives, friends, acquintances, neighbors, along with competitors, enemies and complete strangers are – or may become – predators. And they prey on anything: happiness, idiocy, doubt, successes, fears and mistakes. We’re browsing people and, with our attention span moving toward zero, we pick snippets of life to mutually patch ourselves up. Humankind is so focused on itself as if we’re in the eve of a scheduled implosion.